Shape-wise, I think the designing duo has succeeded. The folded main body and the slight envelope styling of that curvy front flap lend themselves to a purse that is quite fashion forward and stylish. Add in the five pretty metal studs, and you are into real fashion territory. The only area I hesitate, therefore, is when it comes to the color. I know that tans and caramel brown shades are harder to get right than, say, a default black, but the mottled golden color reminds me of those maps and letters you used to dye with teabags in history class. It isn't particularly luxurious, and it is a little too bright to really look classy. Still, this is really just a matter of personal taste. 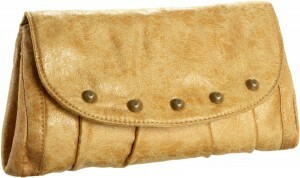 If the Vance clutch does float your boat, then you know that there are many reasons for it to do so. The eco-friendly synthetic vegan leather and the fact that Matt & Nat have provided two handle options, to mention but two. In a world of genuine leather and less eco-friendly morals, this is a purse perfect for people who like to wear fashion without paying any sort of animal price. The Big Buddha Liberty bag, a great alternative to this vegan bag.